Noun. Also bogy. Mid-19th century. When I was young (really young), my brothers were babysitting me one night and, doing what a little brother does, I was being difficult about going to bed. One of my brothers told me that, if I left the bedroom again, the Bogey Man would get me. I had no idea what the Bogey Man was, so it was left to my terrifyingly vivid imagination, conjuring an image of an awful green man, dripping with bogies, stalking the halls of our house in search of children to eat. 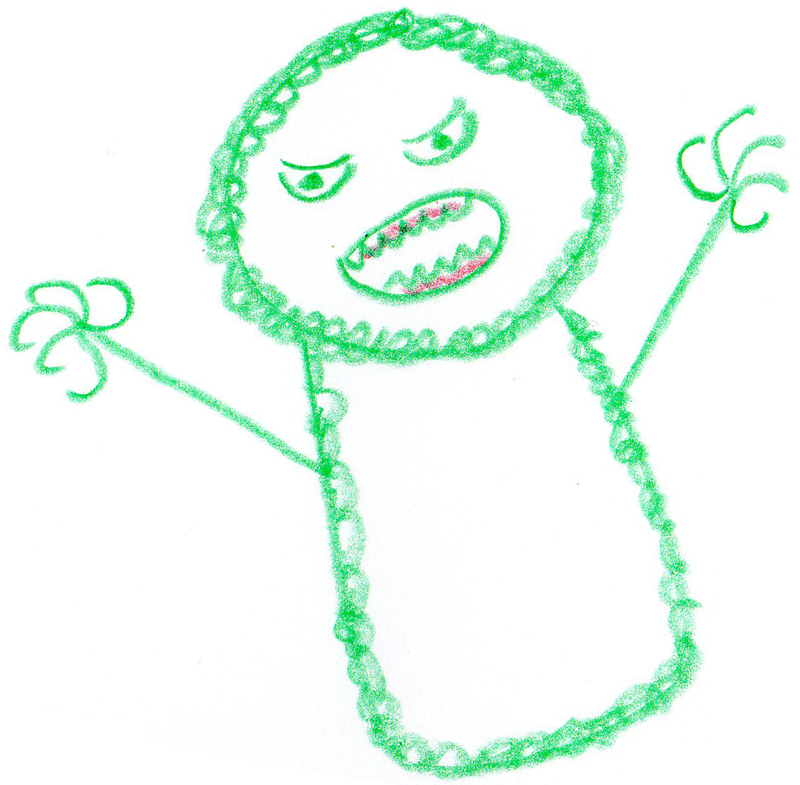 The clear image of the Bogey Man and the terror he instilled has never left me, although at least in adulthood I have a clearer idea of his origins and know that at least he's nothing to do with bogies of the mucus variety. Were you ever told of the Bogey Man? We called him the boogeyman. I was never worried about him (most definitely male!) as the family dog slept with me, and kept all monsters at bay. Much to my siblings disgust! Yes, the Bogey Girl or Boogeygirl just doesn't have the edge of fear, does she? Definitely has to be a man. When I visited the wonderfully named Sallynoggin in Ireland I got into trouble with the word bogey. I was doing a talk to kids and discovered after a joke had fallen dead flat none of them knew what a bogey was. The word I should have used was mer-mer (sorry, I don't know how to spell that, but that was how you said it). But then a dozen miles up the road, doing another talk, no one had ever heard of a mer-mer - or a bogey, for that matter. There, it was, rather delightfully, a snotter. I've never heard mer-mer or anything like it, though I have heard snotter. I had no idea that 'bogey' wasn't widely understood here, but then I suppose adults spend less time talking about bogies than kids, don't they? Sometimes definitions of words create as many questions as answers for me. For example, "3. figurative. A bugbear." I had never heard of this term as comparable to the "bogeyman." I must say I'm glad no one terrified me with tales of scary creatures from folklore. I know what you mean, Kara, although a 'bugbear' was originally a type of monster that ate naughty children. Generally it's used now as something that someone finds particularly irksome. There's also 'bugaboo' meaning exactly the same thing. Us parents need to find a new way of coaxing our children into good behaviour! Interesting! As for children, horrifying stories are quite the method for garnering good behaviour ha. On a side note, "we parents" rather than "us parents." Finally! Something I do know haha. I hope you don't mind my correction.